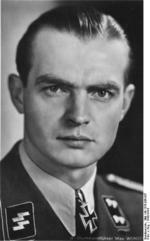 ww2dbaseMax Wünsche was born in Kittlitz, Schleswig-Holstein, Germany. He joined an agricultural union in 1928, and for a short time he was employed as an estate manager. In Nov 1932, at the age of 18, he joined the Hitler Youth. In Jul 1933, he joined SS organization of the Nazi Party. After officer training at Jüterbog in Brandenburg and Bad Tölz in Bavaria, he became a platoon leader of the 9th Company in the Leibstandarte SS Adolf Hitler. In Oct 1938, he was assigned to Adolf Hitler's bodyguard unit as an orderly officer. ww2dbaseIn Jan 1940, Wünsche returned to the SS Leibstandarte unit as the platoon company in the 15th Motor Cycle Company and participated in the invasion of the Netherlands and France. In Dec 1940, he was made the adjutant to Sepp Dietrich, under whom he participated in the German invasion of the Balkan Peninsula. During Operation Barbarossa, the German invasion of Russia, he flew reconnaissance flights in a Storch aircraft. In Feb 1942, he was given command of the Sturmgeschütz Battalion within Leibstandarte; his battalion was involved in halting several Russian attempts to break through German lines in the following couple of months. On 1 Jun, he returned to Germany to study at the staff college; upon completion of his studies, he was promoted to the rank of Sturmbannführer. 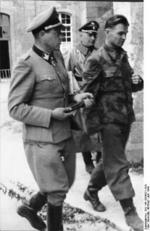 In Sep 1942, he returned to the Sturmgeschütz Battalion and resumed his role as its commanding officer. In Oct, he was given command of a newly formed tank regiment, with which unit he participated in the First Battle of Kharkov at the end of that month. Between 10 and 13 Feb 1943, his troops broke through Russian encirclement of the 1st SS Reconnaissance Battalion, and then the two battalions jointly defeated the Russian VI Guards Cavalry Corps during the next two days; for this action he was awarded the German Cross in Gold. On 25 Feb, Wünsche located an enemy force and defeated it on his own initiative, destroying 52 heavy guns and causing 900 casualties, earning him a Knight's Cross on 28 Feb.
ww2dbaseIn Jun 1943, Wünsche became the commanding officer of the 12th SS Panzer Regiment of the 12th SS Panzer Division "Hitlerjugend" stationed in France. On 7 Jun, his regiment was engaged in the Battle of Normandy, destroying 219 Allied tanks over the following month; he was awarded Oak Leaves to his Knights Cross for his achievements at Normandy. In Aug, his regiment was trapped in the Falaise Pocket. On 20 Aug, he and two officers attempted to escape the pocket on foot, and was captured by Allied soldiers on 24 Aug. He was a prisoner of war at Camp 165 for German officers at Caithness, Scotland, United Kingdom until the end of the war. ww2dbaseIn 1948, Wünsche was released from captivity and returned to Germany. He became a manager of a industrial plant in Wuppertal, North Rhine-Westphalia, Germany until 1980. He passed away in Munich, Bavaria, Germany in 1995. 20 Apr 1914 Max Wünsche was born. 18 Apr 1995 Max Wünsche passed away.